About 60 percent of domestic banks—a slightly larger fraction than in the April survey—reported having tightened lending standards on commercial and industrial (C&I) loans to large and middle-market firms over the past three months. About 65 percent of those institutions—up notably from roughly 50 percent in the April survey—also indicated that they had tightened their lending standards on C&I loans to small firms over the same period. 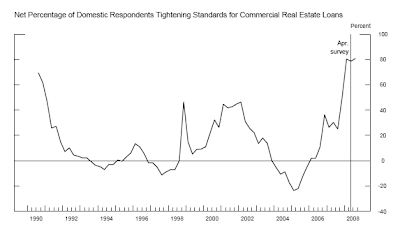 About 80 percent of domestic banks — a fraction similar to that in the April survey — reported having tightened their lending standards on commercial real estate loans over the past three months. 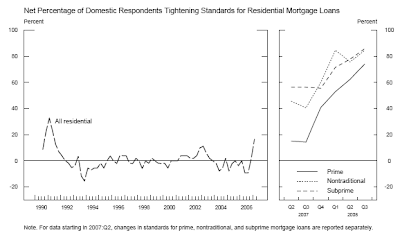 Large majorities of domestic respondents reported having tightened their lending standards on prime, nontraditional, and subprime residential mortgages over the previous three months. About 75 percent of domestic respondents—up from about 60 percent in the previous survey—indicated that they had tightened their lending standards on prime mortgages. About 65 percent of domestic banks—up notably from about 30 percent in the April survey—indicated that they had tightened their lending standards on credit card loans over the past three months, and about the same fraction of respondents—up from roughly 45 percent in the April survey—reported having tightened standards on consumer loans other than credit card loans. The Wall Street Journal is reporting Banks in Euro Zone Tighten Lending Again. Banks in the euro zone continued to tighten lending standards during the second quarter amid a deteriorating economic outlook, and criteria could become even tighter, according to the European Central Bank's July Bank Lending Survey. "The ongoing tightening of bank credit standards and the further weakening in demand for bank loans strengthens our belief that the euro-zone credit cycle is turning sharply lower," said Martin van Vliet, an economist at ING Bank. The Fed's July Senior Loan Officer survey should be released soon - and will probably show banks tightened lending standards in the U.S. too. The Credit Crunch continues. And the 2nd half recovery - projected by many economists - has been cancelled. Bloomberg is reporting Money Market 'Plagued' by Libor That Fed Can't Reduce. A year after central banks started to pump trillions of dollars into the financial system to end a seizure in credit markets caused by subprime mortgages, cash is about as tight as it's ever been. The U.S. market for commercial paper, or short-term IOUs, backed by assets such as mortgages has shrunk 40 percent from its peak in July 2007. The amount borrowed in pounds between banks in the U.K. fell by 70 percent in June from a record in February 2007. The European Central Bank received $100 billion of bids for the $25 billion it offered to financial institutions on July 29, the most since the sales began in December. Efforts by the Federal Reserve, ECB and Swiss National Bank to shore up the world's biggest banks and promote lending have had limited success. The London interbank offered rate, the basis for at least $150 trillion of financial products, is within 0.06 percent of the highest since November 1999 compared with the Fed's benchmark interest rate. "The money markets have ceased to function as they should, as nothing has been resolved with regards to the lack of trust between banks," said Marius Daheim, a senior bond strategist in Munich at Bayerische Landesbank, Germany's second-biggest state- owned bank. "This is why you're seeing such demand for central bank money 12 months on from the start of the crunch. These measures were only supposed to be temporary, and they're looking increasingly permanent." The credit crunch continues. Banks do not want to lend and consumers are reluctant to borrow. Writeoffs and expected writeoffs continue to rise. This is as one would expect in deflation.